I thought after my last post that I’d do a quick video to show you how to do the front roll. As you can see, it only took a few minutes and that was with Betsy charging about! I have also incorporated some super-quick victory rolls in the second half, but I have a video dedicated to these on YouTube. Apologies for it being in 2 halves, someone tried to call me half way through and it stops the video. 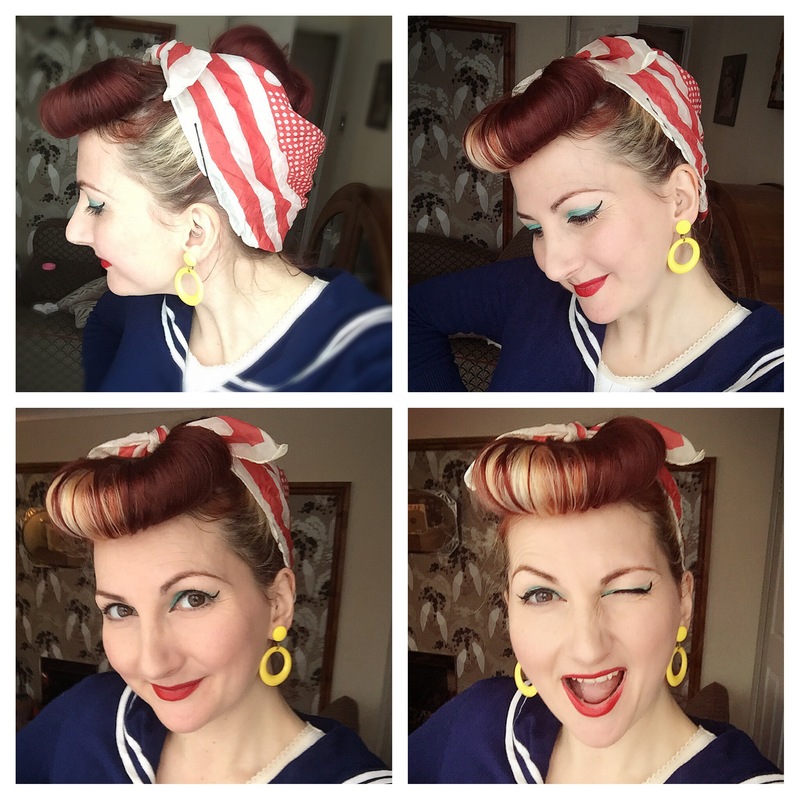 Posted in Fashion and Shopping and tagged 40's hair, hair styles, hair tutorial, pompadour roll, rockabilly hair, vintage hair. Bookmark the permalink. Retro Hairstyle using Sponge Rings! I’m a huge fan of these sponge rings. 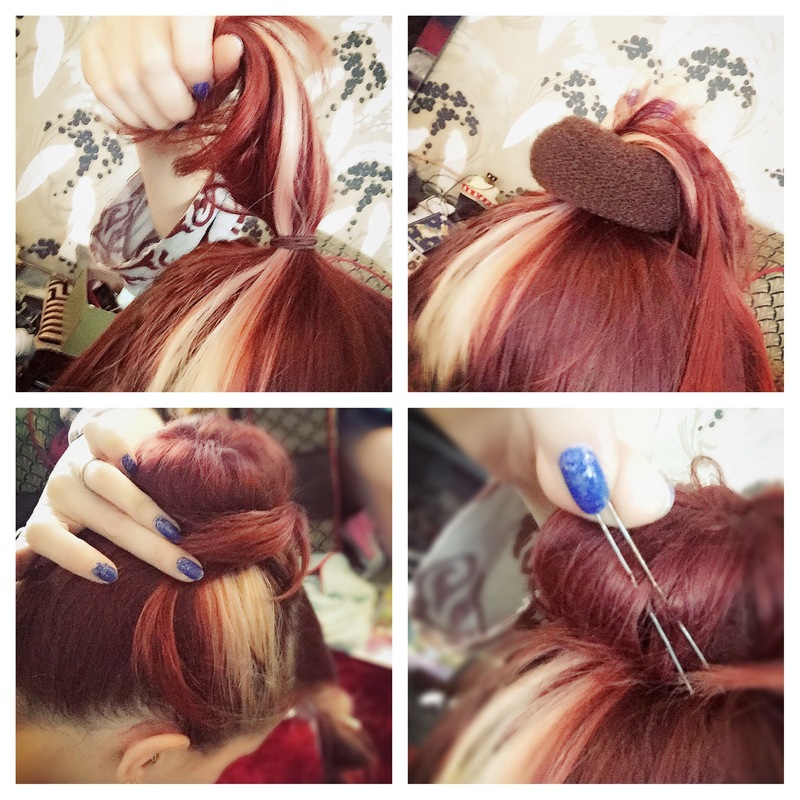 From beehives to Bride of Frankenstein, pompadours to Princess Leia buns, they are so useful! I have a small one that I have cut in half to use for front rolls, which look super with rockabilly, pachuca or 40’s styles. I’ve added a bun at the back this time as my friend was asking how to use one. So here is a quick photo tutorial. I hope it makes sense, please post questions if not! Place the bun ring over it so your ponytail comes out of the centre. Fan the hair out to cover the sponge all the way around. I just use my fingers to figure out which bits aren’t covered. Next put another hair band over the top, so you have a bun with straggly ends all the way around. Tidy these ends with hair pins around the base of the bun. This takes a bit of practise, but is really effective. I have by bangs cut shorter, but I can still roll these up with the rest of my hair. This is where the cut sponge ring comes in. Take the front section of hair (I usually do a triangle from the top of my head to the sides, but you can also do a side one of these which looks awesome) and start rolling it around the sponge. Try to spread the hair out as you go to cover the length of the sponge. Once you have reached the top, curve it into a half oval and pin the hell out of it. I usually have to tidy up the 2 ends and sometimes find it impossibly on a bad hair day. This can be remidied with a scarf, flowers or victory rolls! So there you have it, a vintage hair tutorial that can be used in so many different ways! Posted in Fashion and Shopping and tagged bun tutorial, hair roll tutorial, retro hair tutorial, retro hairstyles, rockabilly hair, vintage hair tutorial, vintage hairstyles. Bookmark the permalink. I am soooooo sorry that this post (and others coming) is crazily delayed. To put it bluntly, I not only have my computer in a rather nippy brick shed, but little Betsy likes to come in here and throw my crafting things around. It takes me a good hour to edit photos before even attempting a post, and that is if Richard is here to look after her! So I thought I would go through my camera card to see what delights we had in 2016 and this was one of them. I have been to the Black Country Museum several times, but never to one of their wartime events. The open air museum is a huge expanse and is also linked to the waterways. Some of you may recognise parts from Peaky Blinders, which used it as a set! You can take a really great tour on the barges through the limestone tunnels that were important networks for the iron industry in the 19th and 20th century. It is an extra fee, but seriously worth it and a nice sit down after all the walking. Live music was scheduled throughout the day, but unfortunately we were too busy walking around to see any of it. BE WARNED! There is an awful lot of walking, so if you have young children, prams, high heels, this can get rather tiring. The ground is uneven or stony in many areas. Things are very spaced out, so be prepared. Also, one thing to point out is that by the coal mine, there is a lot of coal gravel. Betsy enjoyed picking these up and her shoes (and Richard’s white trousers) got covered in coal dust. Not a major thing, but just a heads-up to parents. We had a wonderful day and I think Betsy enjoyed the strange sights and sounds too. There is a little park area that she could toddle about in and she didn’t cry once in the darkness of the canal tours. There are plenty of places to eat and we chose the restaurant after the barge ride. It serves hot and cold food and we ate a little early to avoid the huge lunchtime crowds! So here are a few photos of our lovely day. Maybe you could go this year! Wearing a 1930’s dress coat, 1940’s crepe dress, original hat and handbag. This wonderful chap interviewed me at Severn Valley Railway 10 years ago! Posted in Events and Performances and tagged BCLM, betsy von mew, black country living museum, black country museum, days out, dudley canal, kitten von mew, open air museums, peaky blinders, richard von mew, west midlands days out, ww2 events, ww2 weekend. Bookmark the permalink.